read Mark 16. Why do men love xbox? William Bennett recently whipped gamers up into a blogging frenzy with an editorial on CNN in which he challenges men to “man up”. He notes that women surpass men in college degrees now by 3 to 2. He says 18-to-34 year old men spend more time playing video games than 12-to-17 year olds. He concludes his editorial with the battle cry: “Get off the video games five hours a day, get yourself together, get a challenging job and get married.” Gamers responded by telling Mr. Bennet to “shove it before I use my Dragon Age Mage abilities on you.” The Gaming Addiction. Just last week I heard Mr. Bennett discuss his opinions in NYC on the decline of manhood at my friend Eric Metaxas’ series, Socrates in the City. Mr. Bennett admits his own sons played some xbox, but that he and his wife monitored it. Mr. Bennett’s solution includes men having better role models. While helpful, I think that’s just a start. You also need to ask why xbox games are so compelling. You need to show people how the kind of adventure you find in an xbox can be yours for the asking in the real world. In quest literature, the unlikely heros are given a commission and then equipped for the trials to come. On their journey, they encounter hardships which draw from them their most hidden inner resources. They discover the reason for the magic rings, swords and suits of armor with which they have been equipped. They will have to figure out how to use each piece of equipment in order to conquer evil. No power is wasted. Every piece of equipment is required. In the end, the unlikely heros triumph against all odds and carry out their commission, which usually involves rescuing people from the grip of evil. Robert McKee, author of STORY, the definitive guide to modern screenwriting, claims that every story is at heart, a quest. Perhaps the allure of Xbox, and the reason that every story can be boiled down to a quest, is that our hearts were made to long for this kind of a quest. Our hearts resonate to the strains of this story. Our hearts are longing to be given a quest of our own – and not just in Skyrim. Is this just a coincidence? Is it a trick of DNA? Is it an evolutionary necessity, in which people who longed to be heroes squashed the DNA (i.e. murdered) their cavemen compatriots who were happy sitting at home in aprons? Or is it because the Lord God Almighty created us this way? Have a look at the last chapter of the gospel of Mark. In it, we discover every aspect of quest literature. Mark ends with the quest of Christ accomplished, and the challenge to each of us to embark on our own quest. Every human in this chapter is an unlikely hero. No one seems to be asking: “I wonder when Jesus will rise from the dead as He told us?” No one believes Jesus has risen from the dead. No one believes anyone else who claims they have seen the risen Jesus. Finally, Jesus appears to the eleven remaining disciples and rebukes them “for their stubborn unbelief.” No human here is a hero. But instead of telling them to “go away,” Jesus tells the eleven: “Go into all the world and preach the Good News to everyone. Anyone who believes and is baptized will be saved. But anyone who refuses to believe will be condemned.” This is known as the Great Commission. Jesus then tells the disciples of the miraculous signs that will accompany them – a list that, at first glance, makes it sound like He is turning them into Indian snake charmers. He says they will survive snake bites and drinking poison. Are these gifts for show? Does Jesus want the disciples to wow people with special effects? As the book of Acts will demonstrate, Jesus is equipping the eleven disciples in very particular ways for the trials to come – including a snake bite that Saint Paul survives. Jesus never does anything unnecessary. He commissions his unlikely disbelieving heros, and equips them with the particular powers they needed to accomplish their quest – the quest to rescue people from slavery to evil. The same quest is offered to each of us 2000 years later. We each have the choice to be lifted out of an ordinary humdrum imperfect life into a life of adventure and quest. We are each an unlikely hero – full of disbelief and stubborn hearts. We, too, often think God is far away. Sometimes we may wonder if God is dead. But God is alive. He is walking in the midst of our lives. All He asks is that we believe. If we accept His commission, God will equip us with the tools we need for the journey. The tools are free for us, because God paid the price for them on the cross. As with all quests, the key to the quest God offers us is to accept that we need the tools He offers us. He will give us power in place of our weakness. He will give us stillness in place of our anxiety. He will give us love in place of hate. He will give us trust in place of envy. He will give us whatever we need to accomplish the tasks he assigns us. He offers us the “full armor of God”. Eph 6: 10-17. We need it: “For we are not fighting against flesh-and-blood enemies, but against evil rulers and authorities of the unseen world, against mighty powers in this dark world, and against evil spirits in the heavenly places.” Eph. 6:12. The key to success is to choose the right battle, and along with it the right weapons. Do we want to be the unlikely heroes who are given a commission, equipped for the journey and vanquish the powers of evil with God’s love? Do we want to be the person God is calling us to be? Do we want to fulfill the destiny for which, deep down, we know we were created? Listen to your heart. It already knows the answer. And as for the issue of how we solve the crisis of manhood… well, I couldn’t even get my son to read this blog. I waved it under his nose (granted he was on the xbox at the time, which was a poorly chosen moment on my part). I rewaved it under his nose, however, when he was off the xbox. He still evinced zero interest in his mother’s thoughts on quests. But that’s okay. Because I truly believe that the best thing we can do for the men in our lives is pray for them. Prayer unleashes all the powers of heaven’s armies. I don’t need my son to read my words. He needs to experience the living God on his own. And he will. 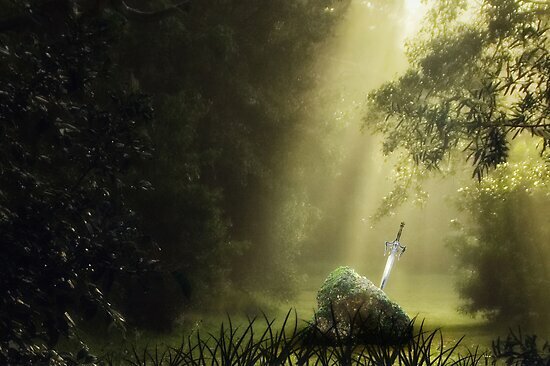 Somewhere there lies a sword in a stone that only he can wield. My heart quickened when I read The Lord of the Rings as a teenager. I knew that Tolkien had tapped into eternal truths. When I met Jesus, I thought: “oh so YOU’RE what I sensed in all those fairy tales, fantasy novels and books, and in those majestic mountains and crashing waves.” So go ahead, xbox. Bring it on. You’re onto eternal truths, but you are not eternally true. Only God is. And only His quest can satisfy our heart’s deepest Call of Duty. Xbox is no match for the One True God. I’m not afraid. This entry was posted in Mark and tagged call of duty, gamers, hours on xbox, Jesus, New Canaan Society, quest literature, skyrim, Socrates in the City, sword in the stone, teenage boys, unlikely heroes, William Bennett, xbox by Caroline Coleman. Bookmark the permalink.